Super Susie's 4th Bucket is Only 24 days away! So much to do there ... So little time! MEDICAL REPORT: Mom's shortness of breath continues to baffle her doctors! Recent Stress Tests say it's not her Heart, X-rays/Scans rule OUT cancer... The good news is that (tho intrusive & annoying) her limited breathing is NOT getting any worse! So ALL arrows are pointing to Sedona! The attached is the backdrop of the geographical area where we will be spending our Thanksgiving Weekend! Spare time for massages, hikes, bikes & Golf! Tom suggested hooking up w/ Pink Jeep Tours www.pinkjeep.com/jeep-tours/sedona/ considered a Do NOT Miss!Can't wait to see everyone there! 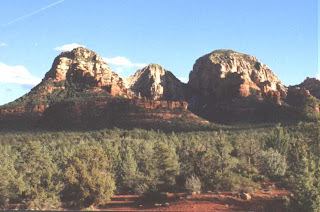 Sedona has become recognized as a sacred land; as a place of power known as an earth energy vortex. Many people are making pilgrimages to this and other places of power, being moved by an inner knowing that this encounter is what they need to help them on their path of awakening and healing. The idea of Sedona being an earth energy vortex may seem like a strange idea to some. It may be easier to consider Sedona as a sacred land the way native peoples have throughout history. From this perspective we understand that the earth is a living being, our Mother, and within her body are many places that are sacred, places that function like organs and glands. And connecting these places is the spider web grid of the earth's energetic body. This spider web grid connects these sarcred places similiar to the way the human acupuncture meridian system connects the vital centers in a humans body. It is important to realize that there are many more power spots in the red rock country around Sedona to consider than just the popularized 4 major vortices of the New Age movement. From a Native American point of view there may well be over a hundred power spots many of which are marked by ceremonial shrines, petroglyphs and ancient ruins. Its a breathtaking place, very beautifull....... Jeep tours are fab.. A must do. Good luck, i'm thinking of you!